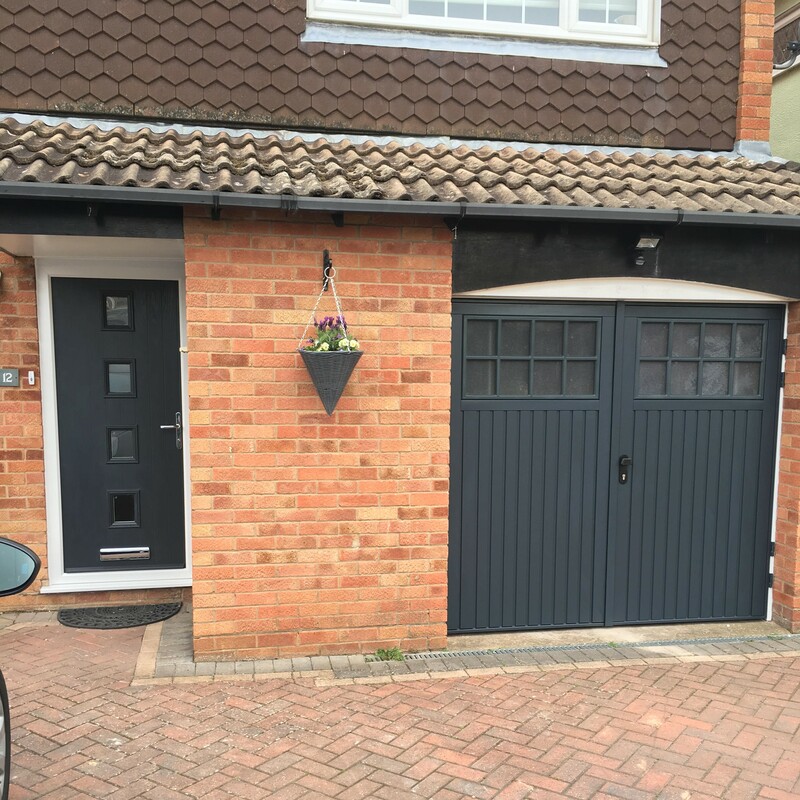 Our customer wanted a matching front door and garage door for this amazing transformation on a property in Warwck, Warwickshire. 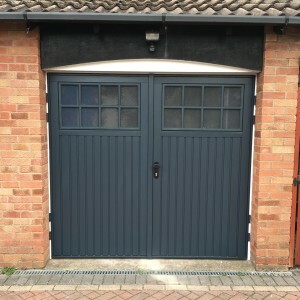 Starting with the garage door, our customer chose the Bedford. 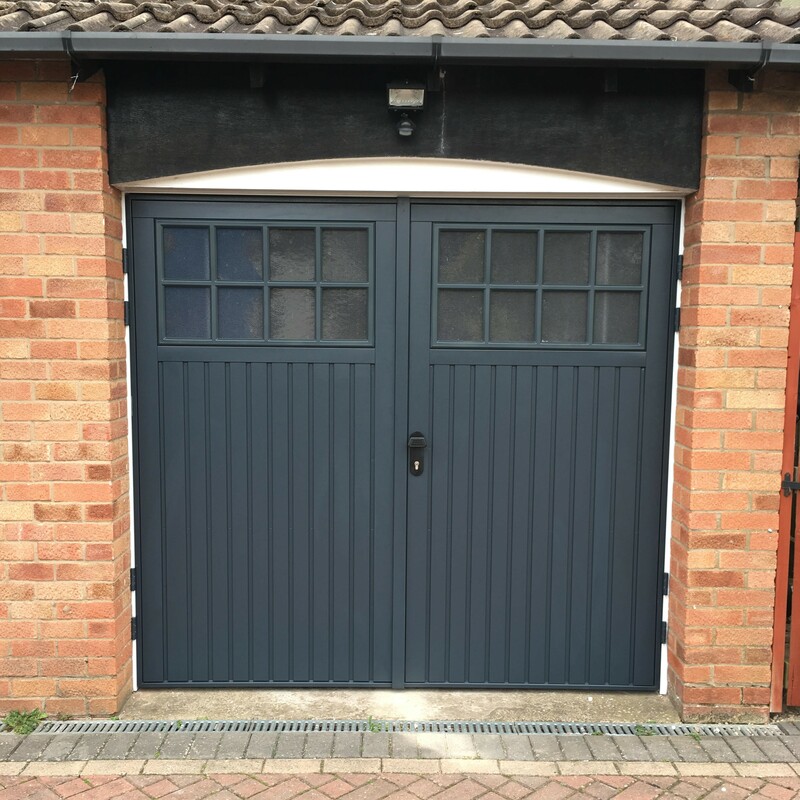 Originally designed to mimic the appearance of traditional timber doors, now available in a choice of 24 fully finished colours, here we have Anthracite Grey with a white steel fixing frame. The doors come with standard black glazing but our customer chose to upgrade to stippled windows, allowing light into the garage. 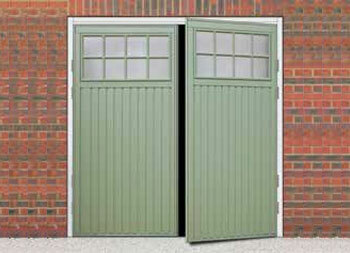 Both the frame and door come with a ten year manufacturer warranty from Cardale. 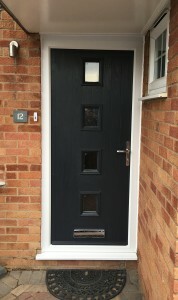 The GRP composite front door is also fully finished in Anthracite Grey, with a white plastic frame. The windows are also stippled, to allow light through but prevent people from seeing in and the customer chose a chrome handle and letter plate to finish the look. The locking system is ‘Secured by Design’ leaving you safe in the knowledge you have a secure front door and comes with three keys as standard. 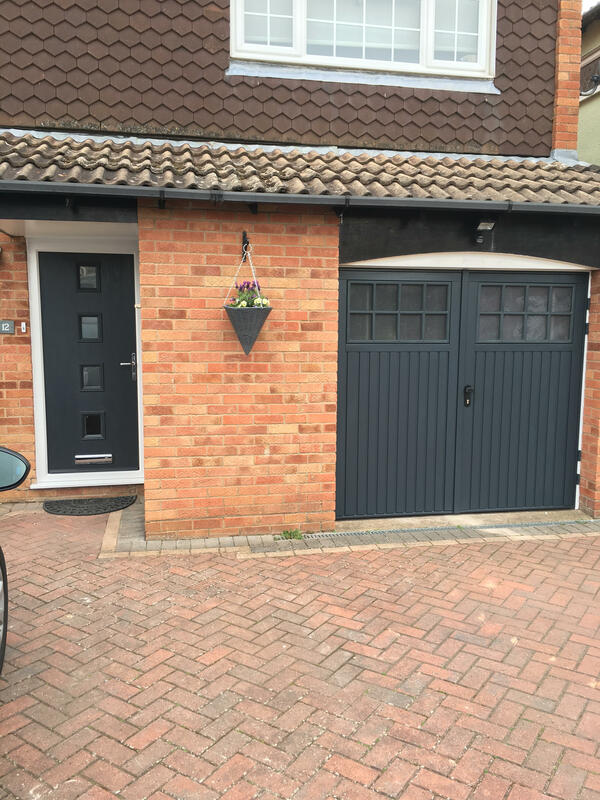 This matching front door and garage door were installed in Warwick, Warwickshire, CV34. For your free no obligation survey give us a call on 01295 272370. “Kerb Appeal”, a phrase made popular in the early noughties by Sarah Beeny (Property Ladder) and Phil and Kirstie (Location, Location, Location), is still just as relevant a concept. We all appreciate a finely presented house and with our British love of “keeping up with the Jones’” it’s every more prevalent today. Whilst the phrase primarily derived from vendors enhancing the look of their home to attract potential buyers, most of us enjoy taking pride in our homes and secretly would like our home to be the best dressed on the street. 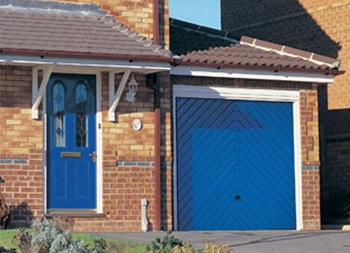 Changing your front door or garage door can transform the look of your home, change both to complement one another, and your Kerb Appeal has gone through the roof! Composite front doors such as those from Door-Stop International are still relatively new to the market but are increasingly popular. Bringing a splash of colour back to your home, without the need to be sanding/re-painting like the timber doors of old, they have a low maintenance finish, easy to look after, but really do bring the ‘wow’ factor. Whenever I am driving in a residential area a composite front door will always catch my eye. 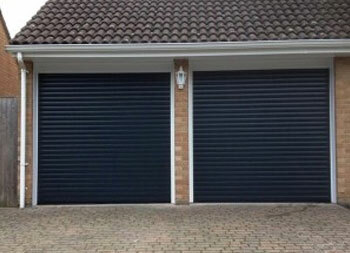 To complement your new front door, consider a garage door to match. 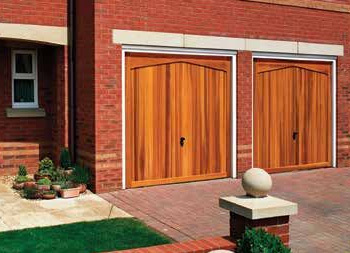 The range of garage doors available has never been so vast. 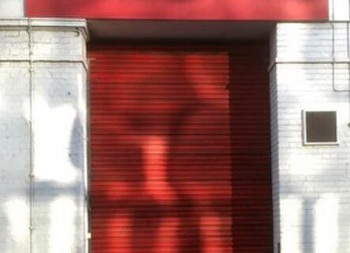 Instead of a standard up and over or side hinged doors you can now choose fully insulated, automated sectional and roller doors, often with a surprisingly affordable price tag. 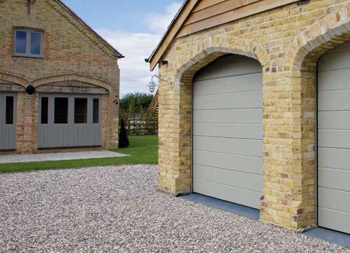 Cardale now offer over 20 colours/finishes to choose from on most of their garage door range. Then there is the window options and handle options to consider. 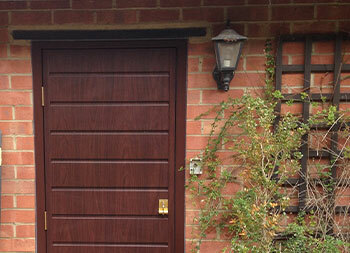 External doors have come a long way over the last sixty years! 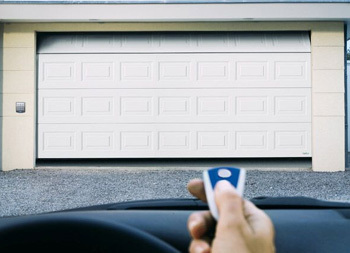 Chances are if you’re in the market for a new front door or garage door you probably haven’t purchased one before and with ten year warranties as standard, you shouldn’t be looking to replace it for a long time after that. So you want to get it right. Research potential installers carefully and consider your options. You don’t need to assume that you must have ‘like for like’, there is so much choice available to you. For help and advice, speak to an experienced installer, such as Elite, who can help you navigate the brochures, give you differing solutions for your budget and supply and install both your front door and garage door to really transform your home and enhance your kerb appeal. For more information about the doors shown here, visit our Completed Projects page. Make your home complete with a garage door from Elite!